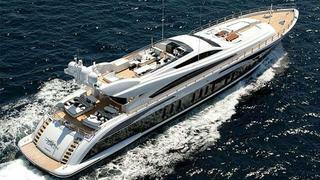 A call to Camper & Nicholsons confirms that Jeremy Comport has listed the 46.2m Leopard motor yacht Pure One for sale. Built by the Arno yard in 2008, her triple MTU engines deliver speeds up to 32 knots. A Pure Design interior combines a versatile layout with elegant styling, cherrywood finishes and sumptuous furnishings, perfect for both chartering and families. She sleeps up to 12 guests in five staterooms including a full-beam master suite, and she accommodates eight crew. Pure One is asking €13.5 million.